Apr 10, 2017 @ 02:00 PM — by Retina Associates, P.A. Healthy retinas are an essential component of great vision. If the retinas are damaged, this can result in severe and sometimes even permanent vision loss. Thankfully the retinal specialists at our Kansas City eye care center can diagnose and treat a number of severe health issues. By diagnosing and treating retinal conditions, we can prevent vision loss and help patients prevent future issues from occurring. One issue that can affect the health of your eyes is known as retinal vein occlusion. This is also referred to as an eye stroke. Let's cover the basics of this retinal condition right now. What Is Retinal Vein Occlusion? Veins carry blood back to a person's heart. When a blockage of a vein occurs, this is called a stroke. Retinal vein occlusions are essentially strokes of the veins of the retina. 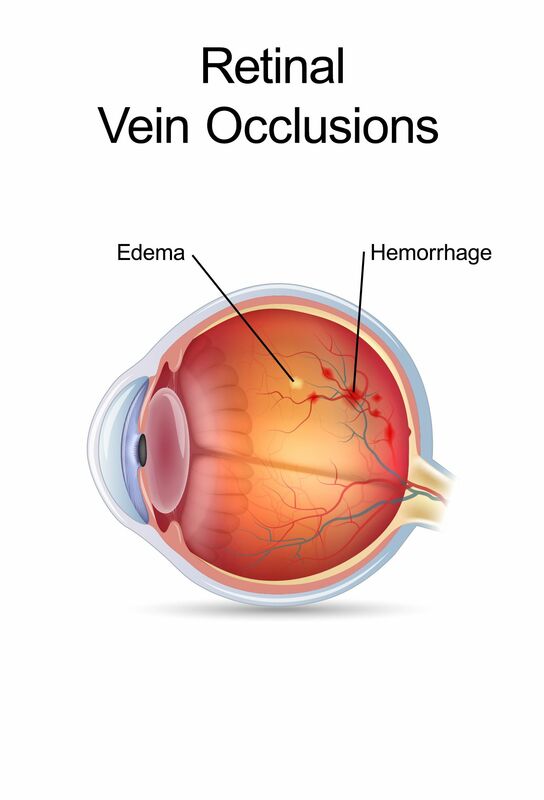 When a retinal vein occlusion occurs, it can result in damage to the blood vessels of the eye as well as the leaking of blood onto the retina. Blood and fluid leaking onto the central portion of the retina can lead to macular edema. When retinal vein occlusion occurs, it usually happens in just one eye rather than both eyes. It is also possible for the arteries (which carry blood to the eyes) to become blocked. Central Retinal Vein Occlusion (CRVO) – This is the blockage of the main retinal vein. Branch Retinal Vein Occlusion (BRVO) – This is the blockage of one of the smaller retinal branch veins. Good overall health and wellness are ways of preventing blood clots from forming throughout the body, so be sure to eat right and get regular exercise. If you should notice any kind of pronounced vision loss, be sure to discuss these issues with an eye doctor as soon as possible. Doing so can save you from experiencing more serious degrees of vision loss. There is unfortunately no known way to unblock the retinal veins, which is why vein occlusion treatment typically invovles addressing macular edema and the effects of the eye stroke. That said, improving the health issues that may have triggered the blockage can help undo the damage done and restore vision. This means that regular exercise and a healthy diet can potentially be part of treatment. Anti-Vascular Endothelial Growth Factor (VEGF) Drugs – Anti-VEGF drugs help address one of the major factors the cause macular edema. Corticosteroid Drugs – Corticosteroid drugs will help combat the inflammation associated with edemas. Focal Laser Therapy – This procedure uses lasers to address swelling that could result in an edema. Pan-Retinal Photocoagulation Therapy – If new blood vessels are forming as a result of blockage, this procedure helps prevent the new blood vessels from leaking and damaging the retina. During an eye examination, we can go over all of your treatment options in greater detail. If you would like more information about addressing vision problems and improving your overall eye health, be sure to contact our team of retinal specialists today. We look forward to your visit and discussing these matters with you in much greater detail.